We found our first fraudulent bus listing today. We found a 23 window Samba listed in New York for $4900.00! For those in the know…. the bus in this condition is 30k+. I showed this listing to Marilyn and was all excited. She noticed that the pictures had a Cardiff Classics watermark. We immediately went to their website and saw that indeed Cardiff was selling the same bus in an auction. Marilyn called Cardiff to alert them what was going on. The man at Cardiff thanked us and all three of us flagged the Craig’s list posting. He gave us some more tips on how to buy a bus. Have the people call us and makesure the caller ID matches the person, have them send a pic of their driver’s license and registration to make sure they match, and finally have a third party mechanic look at the bus. This is beginning to get a little harder. We are finding many buses in our price range that have bench seats without any camping interior, or no interior at all. I have spoken with Woody (I need a kitchen too) and he mentioned that he is a custom cabinet maker and could build an interior for our potential bus. We also spoke to a gentleman in Denver with a nice bus without an interior. 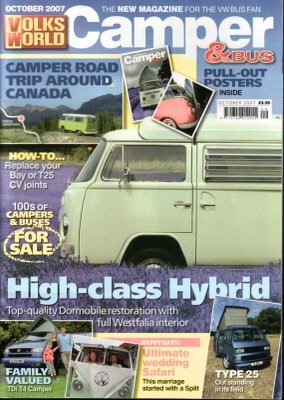 He mentioned that we could buy a camper box from some of the businesses that advertise in the back of VolksWorld magazine. Marilyn set out to find this magazine yesterday. She found it….. it is a UK magazine….. $8.75 a copy and it is November’s issue! I really appreciate Barnes and Noble giving us a discount on a publication that is 4 months old!